Since 2004 he is a member of the International Federation of Journalist (IFJ) which was a consequence of prolonged cooperation with various life-style and aviation magazines and during the year 2010 he became a member of the Federation of European Professional Photographers (FEP) after his work was reviewed by the jury of professionals in the industry. 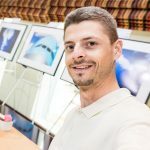 In 2016 he received the FEP-EP qualification as an acknowledgment of his professional standard and in 2017 he confirmed his standard and achieved the FEP-QEP (Qualified European Photographer) qualification. Also in 2017 he successfully attended as a finalist in the FEP Year Awards competition in the Reportage and Wildlife category on 4th and 6th place respectively. And if it wasn’t enough during 2017 he held successful Aviation Art Photography exhibition which followed after the certificate from EPSON was received certifying achieved technical perfection in printing and therefore enrolling in EPSON’s program for Limited Edition prints. During year 2018 he received award in the FEP Photographer of the Year 2018 in the Reportage category again. He likes to think of photography as of a whole process beginning from pre-production taking it thru the image creation to the retouching, printing, framing and beyond.